Minnesota Sen. Al Franken will resign from the United States Senate "in the coming weeks" he announced Thursday, a day after a number of his Democratic colleagues called for him to step down amid mounting allegations of sexual misconduct against women. Add Al Franken as an interest to stay up to date on the latest Al Franken news, video, and analysis from ABC News. 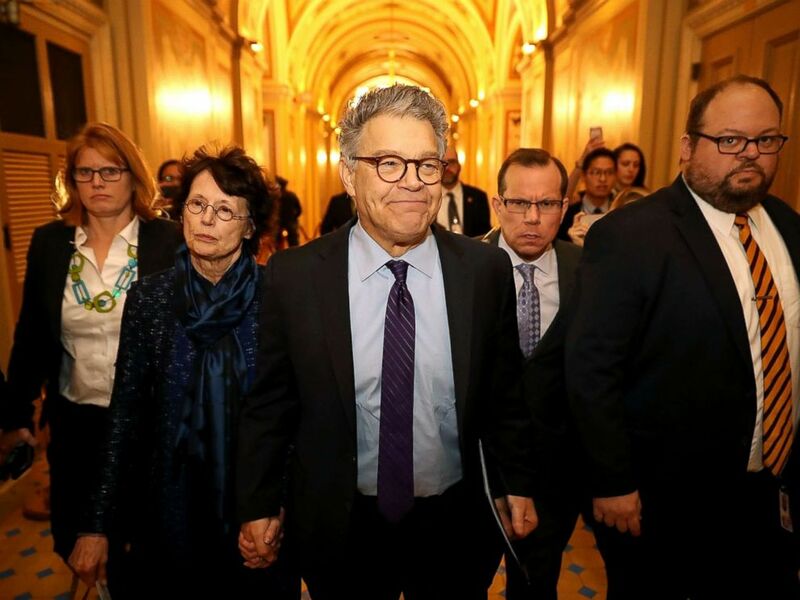 "Today I am announcing that in the coming weeks, I will be resigning as a member of the United States Senate," Franken said on the Senate floor. "It's become clear that I can't both pursue the Ethics Committee process and at the same time remain an effective senator for [the people of Minnesota]." The allegations against Franken began less than three weeks ago, with the account of a Los Angeles radio host who described his actions while the two were on a USO trip together in 2006. Though he apologized, acknowledged some wrongdoing and called for an ethics investigation to be initiated, he resisted early calls for his resignation, even after additional accusations of misconduct surfaced. The tipping point seemed to come on Wednesday, when, in a coordinated effort, Sens. Kirsten Gillibrand, D-N.Y.; Mazie Hirono, D-Hawaii; Claire McCaskill, D-Mo. ; Maggie Hassan, D-N.H.; Patty Murray, D-Wash.; and Kamala Harris, D-Calif., called for Franken to resign. A host of additional Democratic legislators and Democratic National Committee Chairman Tom Perez joined the female senators in urging Franken to give up his seat. In his speech Thursday, Franken advocated for the public to believe the accounts of women who voiced claims of sexual assault and misconduct but steadfastly continued his denial of some of the allegations against him, and at no point in his remarks did he offer an apology. "I know in my heart that nothing I have done as a senator — nothing — has brought dishonor on this institution," he said. He contrasted the response to accusations against him to those against Donald Trump and Alabama Senate candidate Roy Moore, who, respectively, fielded and are facing similar claims during their campaigns. Moore has regained the support of Trump, the Republican National Committee and a growing number of Republican senators before Tuesday's special election, after at least eight women have accused him of sexual misconduct or inappropriate behavior toward them when he was in his 30s and, in some cases, the women were in their teens. During the 2016 presidential campaign, roughly a dozen women accused Trump of earlier sexual misconduct or assault. Trump and Moore have denied the allegations against them, with Trump going so far as to call his accusers liars and threatening legal action. He has not acted on that threat. 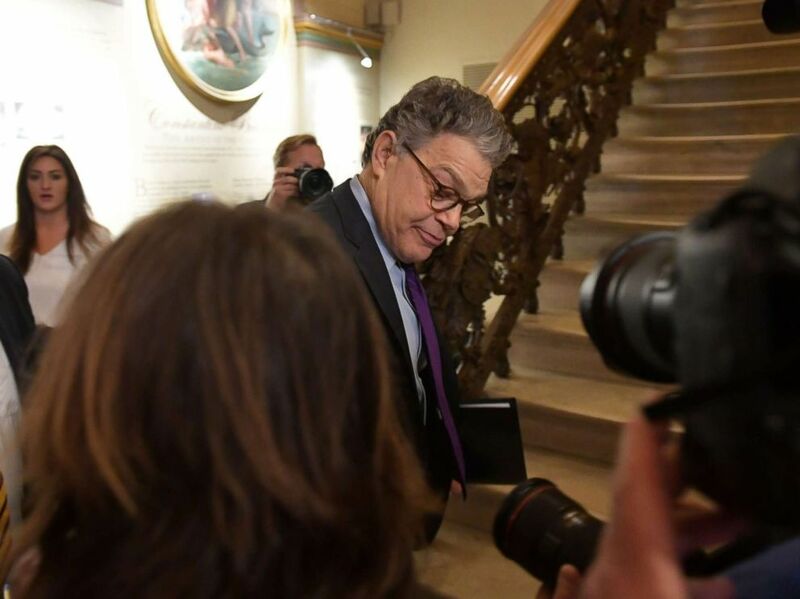 Democratic Senator Al Franken, under mounting pressure from within his own camp over multiple allegations of sexual misconduct, arrives to make an announcement, Dec. 7, 2017 on Capitol Hill in Washington,D.C. As powerful Hollywood executives and stars faced a reckoning over sexual misconduct and assault allegations, attention also turned to those on Capitol Hill. Rep. Jackie Speier, D-Calif., and other female members of Congress shared their #MeToo accounts of sexual harassment and assault during a hearing to review sexual misconduct policy in the House. Franken spoke out in support of the women, after having sponsored legislation to combat sexual assault and violence against women. "Sexual harassment and violence are unacceptable. We all must do our part to listen, stand with, and support survivors," Franken tweeted. In November, Leeann Tweeden, the radio host, was the first to go public with allegations against Franken, saying he forcibly kissed and groped her in 2006. She claimed that he "forcibly kissed me without my consent" while rehearsing for a skit on a United Service Organizations tour to entertain U.S. troops in Afghanistan. "I felt disgusted and violated," she wrote of the alleged incident in a blog post published Nov. 17. Tweeden further wrote that Franken groped her while she was sleeping and included a photo of him appearing to place his hands on her chest. He apologized at the time for the photo but said he did not remember rehearsing for the skit in the same way. Senate Majority Leader Mitch McConnell then called for an ethics investigation into Franken and the incident with Tweeden. After Tweeden, seven other women came out with similar allegations against Franken. Sen. Al Franken and his wife Franni Bryson arrive at the U.S. Capitol Building, Dec. 7, 2017, in Washington, DC. Franken became known to the public as a comedian and cast member of NBC's "Saturday Night Live" for 15 seasons. A Minnesota native, he decided to pursue politics, winning a close recount in the 2008 Minnesota senatorial election and being re-elected in 2014. Before his resignation, he had been mentioned as a possible Democratic presidential candidate in 2020. He is the second lawmaker to leave Congress amid sexual misconduct allegations in the wake of the #MeToo movement. On Tuesday, Rep. John Conyers, D-Mich., announced his retirement after more than 50 years in the House of Representatives after accusations of sexual misconduct and discrimination. In her statement Wednesday calling for Franken to step down, Gillibrand said she has "no doubt" there will be more accusations against Democratic and Republican lawmakers "because Congress is not immune to this scourge." Democratic Minnesota Gov. Mark Dayton may name someone to temporarily fill Franken's seat until a special election is held in November 2018. After Franken's announcement Thursday, Dayton said in a statement he has not reached a decision on a replacement but will do so in the "the next couple of days."